The houses in this aerial photograph were built in the early 1900’s by the Ipswich Mills Company to house the workers of their mill, located just east of this area. The company was the largest employer in town and the largest producer of stockings in the world. 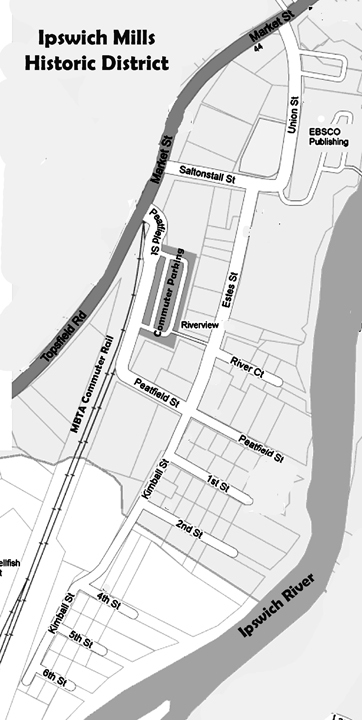 Six parallel streets, 1st Street to 6th Street plus Estes and Kimball Streets were laid out by the Ipswich Mills Company to provide housing for their workers, many of whom were Polish. This area became known as “Pole Alley”. The Ipswich Mills Historic District is the community in Ipswich MA west of EBSCO Publishing bordered by Union St., the MBTA commuter rail tracks and the Ipswich River. The former woolen and stocking mill buildings more recently housed Sylvania’s fluorescent lighting plant, and are where in 1942 Sylvania designed and assembled the proximity fuse for WWII bombs. The buildings now are the home of EBSCO Publishing. Lace and stocking-making developed as a home industry in Ipswich after the first stocking machine was smuggled from England to Ipswich in 1822. 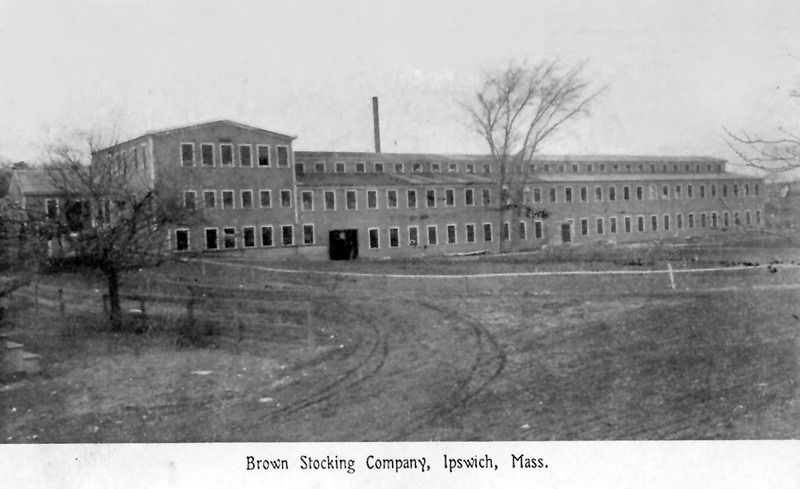 In 1868, Amos A. Lawrence established the original Ipswich Hosiery Mills in the old stone mill on County Street. By the turn of the 20th century the company had moved to the Ipswich Mills location and had become the largest stocking mill in the country. Tanning, shoe making and machine knitting industries also started up, and immigrants from England, Ireland, Canada, Poland and Greece arrived in Ipswich to work in the mills. Many of their descendants still live in Ipswich, contributing to its diverse cultural heritage. At various stages the Company hired English, Polish, Greek, Canadian, and Irish workers, making the Alley a very diverse ethnic area. In order to afford the houses, workers brought in boarders. One account indicates that there were as many as four to a room in these two-bedroom houses. As late as 1917, 75% of the Ipswich Mills workers were women and although the town directories list the men and their occupations, it can be assumed that many of these women were working in the Ipswich Mills. When the Ipswich Mills Company closed in 1928 the houses were sold for as little as $2000, often to the Polish residents who had worked in the mills. Most of the houses remain single-family residences today and are valued in the $300,000 range. (reference MACRIS listing by the Ipswich Historical Commission, 1990). The Brown Stocking Mill Historic District is across Topsfield Road and includes mills and worker housing dating from 1906 at the Brown Stocking Mill on Brownville Ave. established by Harry Brown. The area is defined as 24—32 Broadway Avenue, 3—41 Brownville Avenue, 10 Burleigh Avenue, 3—5 Burleigh Place, and 35—47 Topsfield Road. Due to their historic nature, the two Ipswich Mills and Brown Mills neighborhoods were each eligible for designation as a National Historic District, an area or property associated with events or developments of significance to the history of their community or which have significant architectural history or engineering achievements. 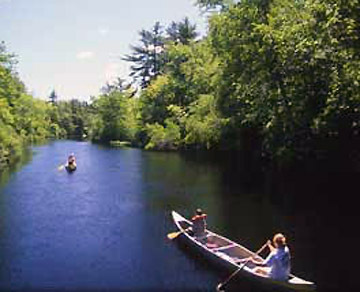 Both districts were added to the National Park Services Registry of Historic Places in August of 1996 after being documented by a professional preservation consultant. That same year EBSCO Publishing moved into the old Ipswich Woolen Mills buildings. The Riverside Building built in 1868 is part of the EBSCO facility and is on the National Register of Historic Places. Owners of properties listed in the National Register may be eligible for a 20% investment tax credit for the rehabilitation of income-producing commercial, industrial, or rental residential buildings. 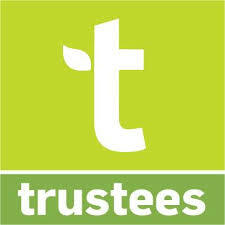 Properties must be rehabilitated according to standards set by the Secretary of the Interior. bottles and debris tossed by the demonstrators. Fifteen persons, including the local leaders of the I.W.W. were taken into custody. Nicholetta was buried at The Immigrant Cemetery, part of the Highland Cemetery Annex on Fowler’s Lane, where there are over 300 immigrant graves, many unmarked. 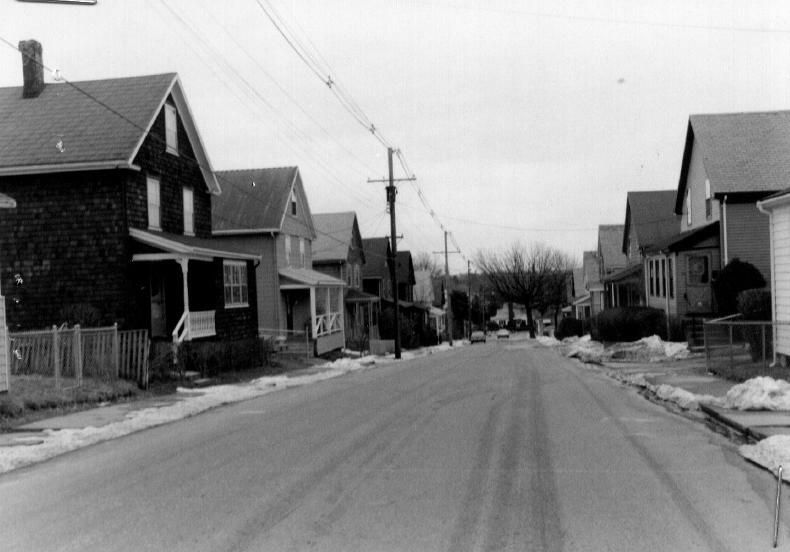 Due to their historic nature, the two Ipswich neighborhoods were each eligible for designation as a National Historic District, an area or property associated with events or developments of significance to the history of their community or which have significant architectural history or engineering achievements. The Brown Stocking Mill was near the intersection of Mt. Pleasant Ave with Brownville Ave. A development known as “New Mill Place” is now at that location. 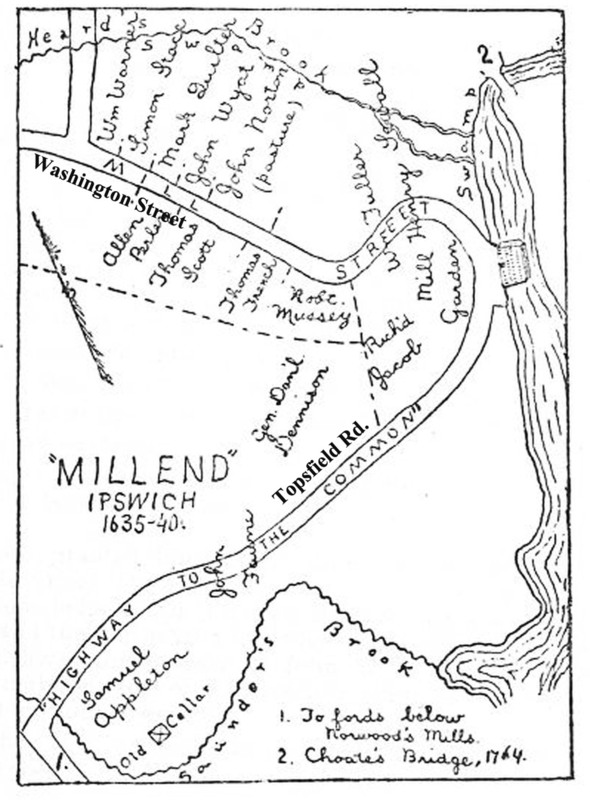 “Millend” was located about the Saltonstall Mill (*the present location of the EBSCO and the Mill District). The ground has become historic. There planted the first Samuel Appleton, John Whipple, and Richard Saltonstall; there the river was first dammed for grist and saw mills. The location of Mill street is not a difficult task, when assisted by a map of the town-center, made in 1717 . The map was prepared by those who felt aggrieved by the denial of a right of way, and was then of sufficient accuracy to be used in court when the case of the right of way was tried. In locating the map, Scott’s Lane” is the present Mineral Street. Mill Street of 1635-40 was the Scott’s Lane of 1717, and the Washington Street of the present day. It was the street, and the only one, that led to the mill, at that early period. The road that led to the west (formerly known as Willowdale Road and now Topsfield Road) was called “highway to the common” land, and there was no street corresponding to our Market street. There was doubtless a footpath through the swamps, but there was no street till 1640 or later. Map of the town-center of Ipswich, made in 1717 . All roads then led to church and to mill, the two prime factors in Puritan living. The Appleton bridge would be an expeditious connecting of Meetinghouse Green and the mill by opening a way into Mill Street. “The highway to the common” led from the mill direct; there was no road over the hill along the upper part of our Market street ; none there was needed.